Spring has sprung – well, nearly. From my desk, I can look out of the window and be fooled into thinking that spring’s arrived. Daffodils are in full bloom, buds are popping out from branches, and, if my vantage point included any fields of sheep, I’m sure the lambs would be racing round. Of course, if I actually open the window, it’s still flippin’ freezing outside. Still, the end is in sight – the days of heavyweight rugs, snow stopping play and ice on water troughs are almost behind us for another year. Here’s to some warmer weather! It’s the start of the proper competition season. Whatever you enjoy doing, everything from dressage to fun rides is starting up in earnest. 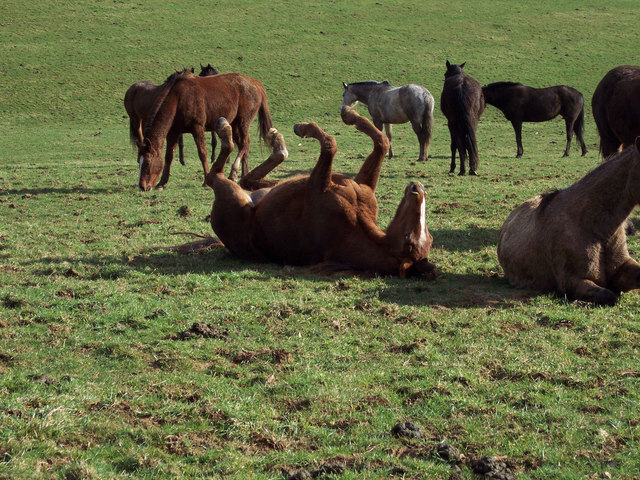 Seeing the horses going out without rugs for the first time – can’t beat that first roll of the season. Lighter nights mean longer hours in the field and less mucking out. Being able to ride in lightweight clothing, rather than Scott of the Antarctic layers. Spring fever. Suddenly, all the horses are going completely doolally – “Look, a leaf! My god, a chicken! Better escape whilst I can…” That’s fine, but I’d rather they got on with it when I was safely on the ground. Increased laminitis watch, leading into sweet itch season. Horse hair everywhere from shedding winter coats. At this time of year, you’ll find it gets into the oddest of places – just don’t wear anything fleecy to the yard. Having to make a decision on an almost hourly basis about whether or not to rug. And mostly getting it wrong. My mare coming into season. ‘Nuff said, the minx. Oooh, that's better! The first roll of the season is the most satisfying. ← Can You Afford to Save Money With Your Horse?